...that the current CINCONI, Admiral Serin Osman, is the highest-ranked Spartan-II? ...that the Forerunners believed they had inherited the Mantle of Responsibility from the Precursors? ...that the bioaugmentation program of the SPARTAN-IIIs was codenamed Project CHRYSANTHEMUM? ...that the M6 Grindell/Galilean Nonlinear Rifle is the official name of the "Spartan Laser"? ...that in addition to writing Halo music, Martin O'Donnell wrote the jingles for Mr. Clean and Flintstone Kids Vitamins? The Flood board the Infinite Succor via a Covenant dropship. 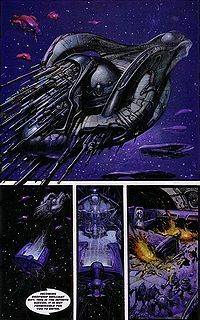 The Last Voyage of the Infinite Succor is the first story in the Halo Graphic Novel. It was written by Lee Hammock with art by Simon Bisley. John-117 on the swamps of Halo. John-117 lands in the swamps of the Flood containment facility and engages several Covenant troops as the Spirit-class dropship Brilliant Gift takes off from the surface of Installation 04. The Brilliant Gift approaches a small group of Covenant ships, including the Infinite Succor. With the crew having failed to stop the dropship from boarding, the Brilliant Gift crash lands inside the Infinite Succor's hangar. Unggoy attempt to quell the fires resulting from the crash as strange creatures begin to emerge from the dropship's wreckage. The hangar is sealed to contain the fire as an Unggoy tries to inform the rest of the ship that they have been boarded, and that the intruders are using human weapons. The Unggoy are killed by gunfire. Unggoy attempt to inform the rest of the Infinite Succor's crew of the crashed dropship and the intruders. Onboard the Seeker of Truth, the flagship of the Covenant Fleet of Particular Justice, Special Operations Commander Rtas 'Vadumee engages in a training duel with Sub-Commander Bero 'Kusovai. After 'Kusovai is defeated, the Commander is called to the bridge, while he and his team are ordered to prepare for a boarding action. On the bridge, 'Vadumee meets with the fleet's Supreme Commander, Thel 'Vadamee, where he is informed that the Infinite Succor has been boarded, presumably by human forces. The Supreme Commander orders the destruction of the Demon as the team's first priority, with the securing of the ship and the Legate onboard as secondary goals. He gives 'Vadumee the command codes for the Infinite Succor, along with the ship's layout. 'Vadumee joins his Special Operations team in a hangar bay where they board the Phantom-class dropship Glorious Advance, and travel toward the Infinite Succor. Upon landing, the entire team disembarks, weapons drawn and ready. They find Unggoy and Huragok blood everywhere, as well as human footprints. The slaughter of Huragok leads the team to question whether the humans were truly responsible for the attack, as they were never so barbaric. The team continues onward and enters a hunting preserve that is usually teeming with animals, but nothing registers on their sensors except for one lifeform. The team prepares to flank the target, realizing it is some sort of parasite. Suddenly, large numbers of smaller creatures start to close in. 'Vadumee realizes the attack was not made by humans and the team starts to open fire on the hostile creatures. Fighting the strange parasites, a pair of Unggoy are killed. Another Unggoy with an armed plasma grenade is shot and drops the grenade, killing his partner and a Sangheili as the team makes their way to the bridge. They come under fire as the creatures start to use human weapons. The survivors of the team make it to the bridge, not letting up against the enemy forces. When they finally make it to the bridge, the commander orders that the bridge be locked down, that the fleet be warned, and the ship's self-destruct set. However, the command codes had already been overridden by the Legate, who, to their surprise, is still alive. The Legate informs the Commander that the Flood spread quickly and that unlocking the command codes would thus compromise the ship. 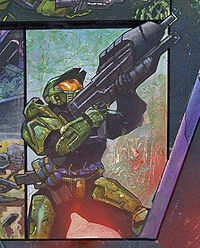 As the Commander argues with the Legate, a Sangheili starts to transform into a Flood Combat Form and begins attacking the others. The Legate refuses to meet 'Vadumee and unlock the command codes until they have been scanned for infection. The Commander leads his team towards the medical bay so they can be scanned. Before they leave, 'Vadumee orders the Unggoy to destroy the bridge to prevent the Flood from gaining control of the ship. The team fight their way to the medical bay, detonating a plasma battery to block the enemy forces, as they had gained the command codes from the infected members of the team. They make it to the medical bay and are scanned. The team meets with the Legate, who had been watching as the Flood took over the ship. The Legate, revealed to be the Minister of Etiology, states that he had the security room installed since the ship had formerly lacked any security room. Luckily, the crew was unaware of it, which is how the Legate managed to remain safe. The Legate tells 'Vadumee that the Flood are mentioned in several religious texts, but that the details are unavailable. He says the Flood had boarded on a dropship, but were not trapped on the Succor. The Flood can infect any dead or living animal tissue, taking control of the creature. As the Flood started to operate with more patrols and with greater intelligence, the Covenant came to realize that the Flood can also retain the knowledge of the hosts they infect. The Legate believes the Flood would use the Slipspace drive to escape the system, as they had gathered in engineering and infected a pilot. Using the command codes, they could easily leave the system and spread. The Flood had also been gathering corpses to a central mass which is thought to serve as their leader and organizer. 'Vadumee decides that the best course of action is to escape the ship and set the ship's course to the sun in the system. However, the Legate instead suggests that the ship be destroyed remotely. The Commander picks up the Legate and slams him on the floor for putting his own safety before that of the Covenant. He then proceeds to initiate his original plan, believing that having the Infinite Succor destroyed remotely would take time which they do not have. The Commander takes three other Sangheili to Engineering while 'Kusovai leads the last four Unggoy and two Sangheili, as well as the Legate, to the Phantom. 'Vadumee's group battles masses of Flood forces as they move toward Engineering. Two of the Sangheili are killed in the battle. The remaining Sangheili is then injured and infected; the Commander euthanizes him, cutting him down the middle with his energy swords, and continues to Engineering. 'Vadumee finally reaches Engineering. On the view screen, the Legate, who has been infected, tells the commander that his team had "joined" the Flood and that there is no way to stop them. The Commander turns to find the infected Sub-Commander 'Kusovai standing in the doorway. They duel with their Energy Swords, 'Kusovai managing to cut off 'Vadumee's left pair of mandibles in the process. As Kusovai mutates further, the Commander launches a lethal blow and then sets a course for the sun. The injured 'Vadumee, the only survivor of the mission, returns to the Phantom and departs the Infinite Succor as it heads into the sun. A work in progress of this story.